I love Morgatha and Alaxia. I could almost make a comic just about them as a kind of odd couple– the warlock who wants to blow everything up and the druid who just wants to meditate in the woods. Away From Reality will soon reach 250 comics, which is about 240 more than I was expecting to create when I first started out. To celebrate this milestone, I am creating a special series of comics that will run twice a week for the next six weeks up to comic #250. This twelve-comic series will follow a continuing storyline with your favorite AFR characters and feature adventure! Action! Drama! Romance! Fencing! Fighting! Torture! Revenge! Giants! Monsters! Chases! Escapes! True love! Miracles! (Or something like that.) Check in every Wednesday and Saturday for new comics. And before I go, let me say that I wouldn’t have gotten to 250 comics without all of you who keep reading. Thanks for being there, and enjoy! Kamalia et alia is a name you should all know, a long-time blogger, artist, and all around interesting person in the world of WoW. Kamalia has very kindly created artwork of my characters. Take a look! I absolutely love this. 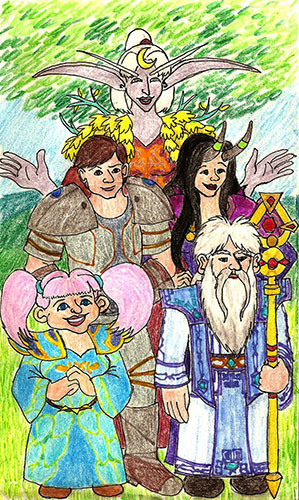 The characters are perfect: there’s Alaxia, Gord, Morgatha, Thizzible, and Hurgon, just as they should be. (Kamalia is so right, Thizzible has really taken over from Targe as the fifth member of the group. I still love Targe, but Thizzible has stolen my heart.) I am delighted to see someone with actual artistic ability do something with my characters, and I am deeply honored to have it come from someone like Kamalia. Thank you so much!